Impulsive 30 THz continuum bursts have been recently observed in solar flares, utilizing small telescopes with a unique and relatively simple optical setup concept (Kaufmann et al. 2015). The most intense burst was observed together with a GOES X2 class event on October 27, 2014, also detected at two sub-THz frequencies, RHESSI X-rays and SDO/HMI and EUV. It exhibits strikingly good correlation in time and in space with white light flare emission. It is likely that this association may prove to be very common. All three 30 THz events recently observed exhibited intense fluxes in the range of 104 solar flux units, considerably larger than those measured for the same events at microwave and sub-mm wavelengths. 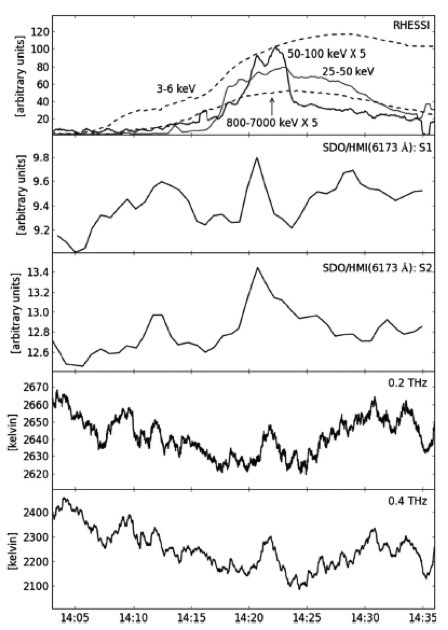 The 30 THz burst emission might be part of the same spectral burst component found at sub-THz frequencies. The 30 THz solar bursts open a promising new window for the study of flares at their origin. The first setup designed to detect solar flares at 30 THz was tested at “Bernard Lyot” Solar Observatory, Campinas, Brazil, using a 15 cm diameter Newtonian telescope, with a microbolometer focal plane array sensitive to 0.5 K. It has been later installed at El Leoncito observatory, in Argentina Andes, for a number of observational campaigns (Melo et al. 2006; 2009, Marcon et al. 2008, Kaufmann et al. 2008, Cassiano et al. 2010). The setup has been later modified using another microbolometer array sensitive to 0.1 K (Marcon et al. 2008, Kaufmann et al. 2008). Recently a similar 30 THz solar flare telescope was installed at the top of a building at Mackenzie Presbyterian University, in São Paulo, Brazil (Kudaka et al. 2015). Both 30 THz telescopes have a “photometric beam” of about 15 arcseconds. The first impulsive 30 THz solar burst was observed on March 13, 2012 at El Leoncito and simultaneously in a wide radio range, sub-THz, SDO EUV and HMI white light, and FERMI hard X-rays (Kaufmann et al. 2013). It was associated with a GOES class M8 flare. The 30 THz El Leoncito observations were carried by the 45 and 90 GHz solar polarimeters, and SST at 212 GHz and at 405 GHz. There was a strikingly good time and space coincidence between the 30 THz brightening and the white-light flare (WLF) derived from SDO/HMI images. The 30 THz peak flux was of about 12,000 SFU (with an uncertainty of order 25%, 1 SFU =10-22 Wm-2Hz-1), almost three decades more intense than the fluxes measured at microwave and sub-THz frequencies for that event. Another intense impulsive 30 THz solar burst was observed with the São Paulo telescope on August 1st, 2014, during a GOES class M2 burst (Miteva et al. 2016). It was simultaneously observed at radio wavelengths, from metric to microwaves, sub-THz, Hα and at EUV. No obvious SDO/HMI white light emission could be seen. The 30 THz flare source position coincides with brightening in Hα images, and SDO 304 and 1700 Å flare images. The emission spectrum exhibits two components, one with a peak emission at microwaves and another one in the THz range. The estimated 30 THz flux was of about 20,000 SFU, almost two orders of magnitude larger than microwaves, and three orders of magnitude larger than the upper limit of the sub-THz emissions. The October 27, 2014 was observed at 30 THz by the São Paulo telescope, associated to a GOES class X2.0 burst. It was also observed at Hα, in EUV and HMI white light, at sub-THz by SST (El Leoncito) and in microwaves by US AFRL RSTN. A white light flare enhancement at two distinct sites has been observed. 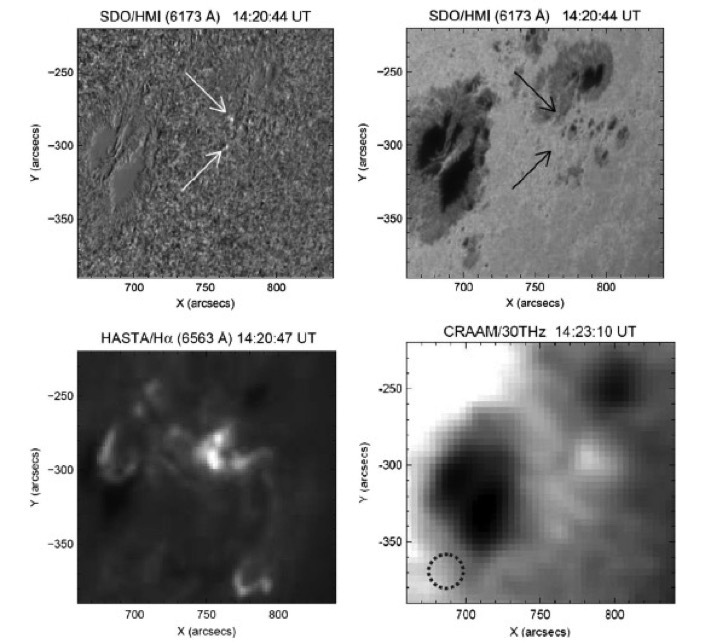 The SDO/HMI, visible, Ha and 30 THz images are shown in Figure 1. Figure 1. Images of the October 27, 2014 flare taken nearly the maximum time. In the top panels we have at left, the two HMI white-light brightening, and at right their positions on the visible disk. Bottom panels show at left the Ha image, and the 30 THz brightening at right. The bottom-left circle correspond to the 30 THz “photometric beam” . The time profiles are shown in Figure 2. The 30 THz flux was of about 35,000 SFU. The SST time profiles show a spike at 0.4 THz and 0.2 THz approximately coincident in time with WLF peaks of the north and south sources, derived from SDO/HMI. The SST spike at about 14:22 UT observed in beams 4 (0.2 THz) and 5 (0.4 THz) have flux densities of about 10 SFU and 150 SFU, respectively, as lower limit values. It coincides with RSTN reported microwave peak times. The complete burst spectrum at maximum is shown in Figure 3. The trends are similar to the two events mentioned before, with one component at microwaves, and another in the THz range. The estimated 30 THz peak flux density for this burst, however, is qualitatively larger than the two previous bursts. Figure 2. Time profiles for the October 27, 2014 solar flare, taken from RHESSI X-rays (top panel); SDO/HMI white-light images, cadence of 45 seconds at the top, compared to SST observations at 0.2 and 0.4 THz (for beams 2 and 5, respectively) at the bottom integrated over one second. One distinctive peak at about 14:22 UT is clearly identified at white light with corresponding impulsive bursts at hard X-rays, at 0.2 THz and at 0.4 THz. Figure 3. The October 27, 2014 burst emission spectrum from microwaves to THz frequencies at the maximum emission time. The impulsive solar bursts observed suggest that the distinct sub-THz spectral component with fluxes increasing with frequency may be extended to 30 THz, exhibiting large fluxes of order 104 SFU. They are one or two orders of magnitude smaller than WLF flux estimates for very large flares. The THz burst spectral component is distinct from the typical microwaves with a peak at about 9 GHz, which is usually attributed to gyrosynchrotron emission from mildly relativistic electrons (Bastian et al.1998). The positive spectral index close to 2 is consistent with optically thick emission, either thermal or non-thermal. However the close time coincidence with the sub-THz impulsive burst, RHESSI harder X-rays, EUV bright flare, and white light two-source brightening may favor a non-thermal origin for the emission. The event may also be explained by alternative thermal mechanisms (Najita and Orrall 1970; Machado et al. 1989, Trottet et al., 2015). These results suggest that the mid-infrared may be the best wavelength region, and certainly more sensitive than white-light continuum, to study emission from the low chromosphere/temperature minimum region. Impulsive 30 THz bursts exhibit fluxes in the range of 104 SFU, much larger than at microwaves and sub-THz frequencies. The combined spectrum shows one component peaking at microwave frequencies, and another component at sub-THz to THz whose flux increases with frequency. Sub-THz, 30 THz and white-light flares may arise from the same bursting source, The close time coincidence of white light brightening with the sub-THz, hard X-rays, EUV may favor a non-thermal origin for the emission. The event may also be explained by alternative thermal mechanisms (Najita and Orrall 1970; Machado et al. 1989; Trottet et al. 2015), or by both combined. The frequency of maximum THz emission remains unknown. 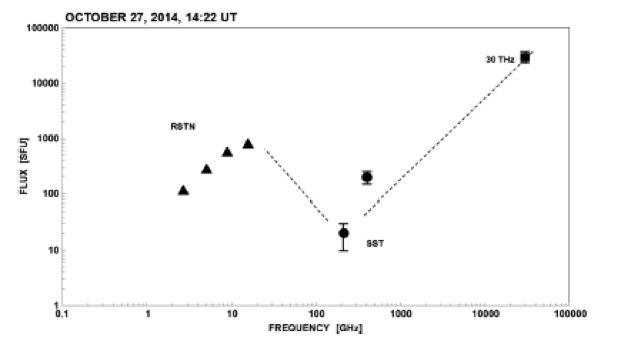 New experiments are being implemented to complete the spectral description at intermediate THz frequencies. 3 and 7 THz photometers to detect solar flares were successfully flown in stratospheric balloon mission over Antarctica in January 2016. One ground-based telescope (0.85, 1.3-1.5 THz) has been completed to be installed at a high altitude site (Kaufmann, 2015). The El Leoncito and São Paulo 30 THz telescopes are being upgraded to attain higher sensitivity.